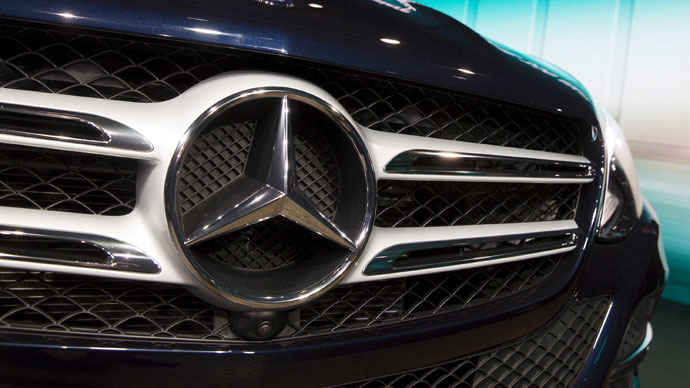 German carmaker Daimler AG is considering building a plant in Russia to produce Mercedes-Benz vehicles. The company is expected to make a final decision in May. Daimler is likely to consider production in three regions of Russia – Saint Petersburg, Kazan and the central Russian region of Sverdlovsk, according to RIA. The president of the Russian investment agency ‘Invest in Russia’ Yuri Spiridonov told reporters the company plans to start building a plant at the end of 2015, and to bring production at full capacity by 2017. He also confirmed that Daimler plans to produce five car models, including the S, E, GL, ML and A class. Shares in KAMAZ soared more than 11 percent on Tuesday morning on the news about the German carmaker’s plans. The company's office in Russia refused to comment on the plans. Daimler AG could use the terms of an agreement signed earlier with another company, including a quota of General Motors (GM), as it will not be able to get specific authority to produce Mercedes cars in Russia, Trade Minister Denis Manturov told reporters Tuesday. "Industrial assembly cannot be carried out from the perspective of Mercedes, as it's already 2015, and the industrial assembly mode ends in 2018," he said adding that Russia will not change the terms of industrial assembly mode, since none of the car makers addressed the authorities with such a request. Daimler said it’s not interested in signing an agreement on industrial assembly at GM sites in Russia, said RIA citing a company representative. In February 2014 the Russian Ministry of Industry said it conducted negotiations with the Moscow Region and Tatarstan to start production of Mercedes passenger cars. Daimler currently has a joint venture in Russia with Kamaz, which produces trucks under the brand of Mercedes-Benz in Naberezhnye Chelny in Russian Tatarstan. In November 2014 Daimler increased its stake in KAMAZ from 11 to 15 percent. GAZ Group in Nizhny Novgorod has an assembly line for Mercedes-Benz Sprinter Classic minibuses. Daimler recorded a loss of €30 million in the fourth quarter of 2014 after the revaluation of investment in Kamaz. In March, General Motors, which owns Opel and Chevrolet announced it was suspending production in Russia amid the deteriorating market and the falling ruble and inappropriate localization levels. The Association of European Businesses said there was a more than 40 percent decline in the Russian car market in March. Russian authorities are actively trying to stimulate domestic business production. One of the latest measures was proposed by the prime minister in March when he initiated extending the ‘cash for clunkers’ program aimed at stimulating sales of domestically made cars.